CarFax’s accident history report can only provide information it pulls from police and insurance records. But vehicle accidents and fender benders go un-reported every day. If you want to know if the car you are looking to purchase has been in an accident, has been repainted and/or has had any structural damage, you cannot rely on public records alone. A vehicle history report does not reveal any information on the car’s current mechanical performance and integrity. A clean service history does not ensure the vehicle is free of mechanical problems or even that previous repairs were performed correctly and with quality parts. Carfax won’t tell you what mechanical repairs or component replacements will be needed in the near future. It’s impossible to predict the future, but wouldn’t you like to know what failures are common on a particular vehicle and what components are a most risk of breaking or malfunctioning? Carfax doesn’t provide maintenance costs on the vehicle. Calculating ongoing maintenance costs into your budget prior to purchase is just as important as negotiating the best purchase price. 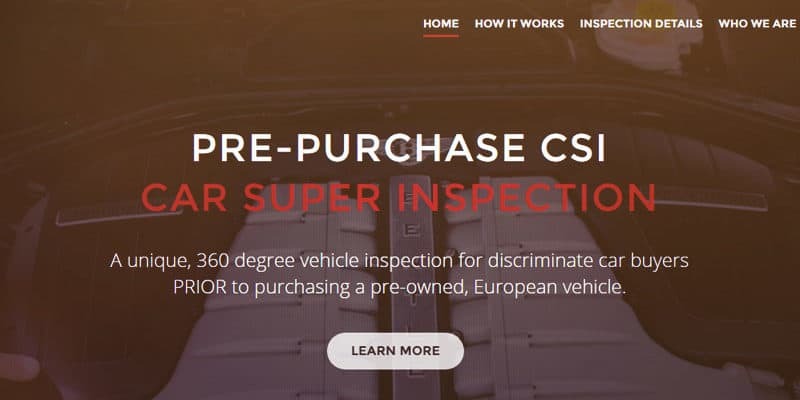 MasterClass Automotive is now offering a unique, 360 degree vehicle inspection for discriminate car buyers PRIOR to purchasing a pre-owned, European vehicle. Whether you are looking to purchase from a dealership or through a private sale, the Pre-Purchase CSI is empowering car buyers by helping them make a well-informed buying decision. The Pre-Purchase CSI can qualify and quantify a vehicle’s structural integrity, mechanical performance and overall safety of any vehicle you are looking to purchase. We specialize in late model BMW, Mercedes-Benz, Bentley, Audi, Rolls-Royce and Ferrari vehicles.